This year has seen the phenomenal rise of the anti-politics politician across Europe and, as the year is coming to a close, it is perhaps time to reflect on the reasons for this development. The first aspect that strikes one when looking at the European political scene is that no country has been spared the ascendance of the populist. Poor or rich country alike, austere or profligate budgets, the political elites have experienced a serious onslaught from those who claim to be standing outside the establishment. In Germany, it is the rise of the Anti-Euro party AfD and PEGIDA (the 'Patriotic Europeans against the Islamisation of Europe'), in Greece it is Syriza and the neo-facist Golden Dawn, whilst in the UK it is UKIP and populist comedians of various convictions. Fascinatingly, this is all 'old hats' when looked at from the perspective of the US. There the main challenge to the political establishment happened earlier and has already waned again, the tea party movement. And it is this movement that may tell us something about why things are happening here in Europe and where things are likely to end up. Initially, the tea party had all the signs of an extra-parlimantarian social movement, advocating empowerment of the citizens vis-a-vis the political classes. As such, it encountered all the challenges of social movements in a time of technological change, where allegiance is paid by 'likes' and collective action is frowned upon as 'old school'. This weakened the effectiveness of the movement significantly, and before long, the tea party morphed into an appendage of the Republican Party. Most observers thought this to be its natural home, its political credo echoing the messages of citizen empowerment over government, yet that is a simplification of the complex mesh of anger and frustration of tea party members who often articulated little more than a virulent anti-politics motive. The core of this anti-political motivation is a clue as to the kinship between the tea party and their European populist equivalents. For members of the tea party, just like for UKIPers and members of the AfD, it was a keenly felt loss of control that lies at the heart of the problem. Populists differ about what it is over which control is lost, immigration, sovereignty ('I want my country back!') or the national budget (enter Syriza: the German 'occupation'), but they are united in the desire to re-gain control over something that is close to their heart. This leads to an analysis of the nature of their populism. A brief survey of political realities reveals that none of their promises can be fulfilled. In an increasingly interdependent world, the re-instatement of national sovereignty over 'international forces', be they bankers, multi-national conglomerates or 'the Germans' is wishful thinking. None of the issues that they would like to re-gain control over is 'manageable' in the old, nation-centred way. Immigration into the UK is not simply a problem of the European right of mobility, solved easily by leaving the EU as UKIP proclaims, but is a long term trend fuelled by rising wealth in developing countries that provides just enough means to ever more people to escape stagnant economies or corrupt regimes to get to Europe (or the UK). It is a product of a world becoming ever smaller in economic and geographical terms, with consequences for travel, mobility and economic interdependence. As for the rest of the populist messages (so-called 'Islamisation' of Europe, or German 'occupation' of Greece) there is little hope for this to change any time soon, simply because they are the results of a wrong take on reality. In essence, populism will fail because it offers the wrong analysis and hence draws the wrong conclusions. Having said this, all this does not mean that the anti-political mood is going to vanish any time soon. The traditional political elites in Europe and the US have proved reliably insensitive to infuse populists like Farage, the organisers of PEGIDA and Tsipras with new life at every turn. Only honesty about the impotence of political decision making can change that, but that is a counter-intuitive message for everything politician. The bread and butter of political life is the promise of a new Jerusalem, of a solution to all problems. Yet, the space for sovereign political decisions is shrinking and shrinking fast, something you wont catch a politician admit, of populist hue or not. So the political class is caught in the bandwagon of promises, and the populists are clinging on for the ride. Few musicians have bridged the German divide more than the Austrian-Swiss chanson singer Udo Juergens. To anybody who knows his songs this seems a strange statement since Juergens provided the soundtrack to the 1970s West Germany, a country that had become comfortable with its reduced relevance in the world. His songs at times scratched the surface of this comfort, often revealing fault lines of modernity that made Germany look not quite as settled as it often felt to its inhabitants. Yet, Juergens mainly delivered sounds of simple ease and joy, something that was in short supply in a country disconcerted by its past and its growing economic might. After the re-unification, concerts in the East showed how much Juergens' music was touching the sentiments of all Germans. Although his ballads were sung by many international stars like Shirley Bassey and Sammy Davis Jr., he himself remained the quintessentially German chronicler of modern times. Only weeks after his last concert, Juergens died on 21 December 2014 at the age of 80. One of the main criticisms of mainstream media is the lack of representation of those who think (and sound) differently. As thousands of people take to the streets in Germany under the banner of PEGIDA (something akin to 'Patriotic Europeans against the Islamisation of Europe') and UKIP steamroll from one by-election victory to another in England, there is much navel gazing amongst the chattering classes about the meaning of all this. Few commentators however note how exclusive their club of gazers had become, and even fewer mention the fact that the media circus has long been populated by the circle of the usual suspects, drawing on the same old interpretative formulas as they tried to make sense of the new. In common perception, and in the US in particular, this is often called the dominance of the liberal elite, a theme that is supposed to draw gasps of contempt and connote pre-democratic attitudes: people just don't know what is good for them. I myself never thought that the media debate is sterile, although subversive voices are sometimes rare indeed. Yet, what PEGIDA, UKIP and tea party sentiments clearly indicate is that spaces of articulating divergence from the public mean are developing, and developing fast, just not within the usual spectator theatres. At the risk of calling a spade a spade, here is what I think is happening in the field of identity politics. The common interpretation of (and anxiety about) identity politics is the ascendancy of particularistic identities at the expense of broader collective, unifying ones. As nation-states struggle to come to terms with migration and assertion of group identities, democratic politics becomes fragmented and the common good lost in a cacophony of voices. Yet, this is the interpretative frame of the 1970s and it owes much of its persuasive power to the strength of the social movements springing up around the issues of civil rights in the US. The new identities are less firm, faster to discard and more chameleon like than those formed in the furnace of the civil rights struggle. Plus, they are shaped and re-shaped in the scatter shot arena of new social media, where loyalties are shifting and belonging is defined by 'likes' of strangers. The most fundamental underlying difference to the identity politics of the 1970s is another phenomenon however. It is the refusal of the individual itself to adopt identity as a criterion of membership to a group. In essence, it is the person outgrowing the neat shapes and boxes we have conveniently produced in order to make sense of the world. Identity is essentially a two way process, comprising of a passive and active strategy of connotation. The first is being described by others ('Fremdbestimmung', as the Germans call it) whilst the second is self-description. The two intersect and fight for dominance in identity politics. Wherever racial coding is particularly strong, strategies of self-description have long tried to mitigate the harm fremdbestimmung does by (partially) adopting and converting the meanings of racial language. The abundant use of the N-word in rap is an example of this. The boundaries of self-description and harmful description by others remain in tact however, as the hapless protestations to the contrary by white sport commentators using the N-word demonstrate. This is the core of the old identity politics where groups can develop collective power, and may collectively defuse the invidious effects of racial language within their own peer group. The main condition for this strategy to work however is a society that is clearly divided along identity lines, reinforced by daily and routinised discriminatory practices. The situation is not as clear in Europe or in other parts of the world. Again, social media is a catalyst and a reflection of the new realities at the same time. Vine's six second shots are full of racial coding bordering on the offensive, yet, fascinatingly, the identities of self-description fail to congeal into group politics. On one hand, this is probably due to the irrepressible yet vacuous nature of the internet 'like', a commitment that costs little and means little. Yet, below the surface something else is happening. The authors of vlogging (video blogging) appear to refuse to adopt identities for any significant time in the first place. Their dominant attitude is one of constant re-definition, rather than affirmation. Identity itself is becoming an ongoing project. The consequences are stunning. It is the demise of the old social movements based on group identities, and the emergence and (often contemporaneous) decline of a myriad of constantly shifting identities, including the subversive merging of self-description with fremdbestimmung. The semantic mode of these new shape shifting 'collectives' is playful, and non-commital. 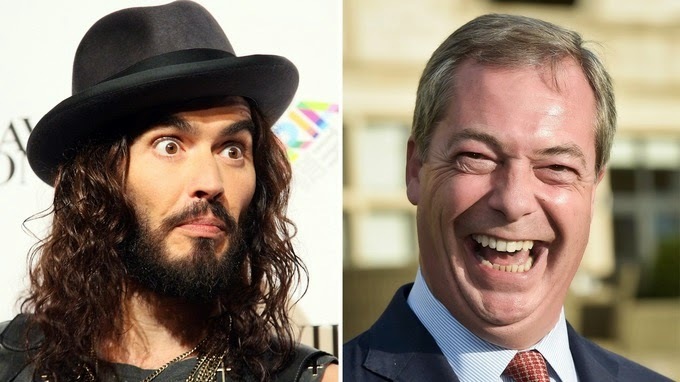 So, what does that have to do with PEGIDA, UKIP and the tea party? As the main strategy of rebuttal to fremdbestimmung morphes from mitigation through appropriation of demeaning language into a void of core identities, interpretative frames built on we-them and same-different dissolve. And so do the chances of creating collectives around strongly felt values informed by group identities. The 'Islamisation of Europe' and the 'Europeanisation' of Britain is the last firm signpost in a landscape perceived to be of shifting sand. It's the associated uncertainty and the fear it evokes in most people that the liberal media is guilty of neglecting. If this analysis captures something approximating what is going on, then perhaps we should be in a celebratory mood rather than despondent. As strong group identities thrive in cultures of routenised discrimination, their passing can only reflect progress in the fight for equality. Maybe PEGIDA and UKIP articulate problems of luxury, rather than desperate situations. Lest we forget however, they old ways are not gone completely yet. Fergusons still happen and it is the irony of the US as a simultaneous beacon of hope and despair that the old and the new exist side by side, probably for a long time to come. In 2008, Peter Longerich published his biography of Heinrich Himmler. The book was well received and even praised by some critics for its comprehensiveness and detail. As I was reading it recently, I became increasingly frustrated by it. The more direct quotes and facts Longerich throws at the reader, the more exhausted one gets. In the end, after more than 750 pages of minutiae, one is left with the impression to know even less about the subject of the biography than before. the person, Himmler, remains a mystery, notwithstanding a plethora of gut wrenching and harrowing details. If Longerich managed to enlighten the reader so little with so much, what went wrong? Biography is historical writing at the intersection of two interpretative paradigms. The first understands the subject and actions as a result of external forces. The second favours a strong version of personal agency, the subject acting and reacting to his or her surroundings. Both perspectives are on a sliding scale and neither are mutually exclusive. Yet, championing one over the other determines the way in which personal responsibility is construed. All historical writing is mainly narrative, aligning events along a chronology that structures the past in before and after. Apart from this most basic of morphological parameters however, historical writing possesses a freedom that few other human ‘sciences’ have. Within this historiographical universe of relative freedom, the history of Nazism represents a particular challenge. The brutality of the regime calls on historians to establish direct lines of responsibility and largely shun contextualisations of guilt. Moreover, writing biography magnifies this dilemma. Biographers of Nazi functionaries feel the pressure to establish personal guilt for the regime’s actions, yet would also like to explain how an individual came to embrace this murderous ideology. The result is often a dance on a wire, oscillating between re-affirming the possibilities of individual agency whilst at the same time embedding their subjects in the context of the time. This balancing act can take various narrative forms. Longerich goes for exhaustive and comprehensive quotations and drowning the reader in facts. At times, it is less a biography but a chronicle of deeds, peppered with evidence chosen from the wealth of written sources that Himmler left behind. What disappears behind this wall of facts is the man himself. The main problem is one of misunderstanding on Longerich’s part of what constitutes agency itself. Hardly anyone believes that simply telling a story about somebody reveals why somebody acted the way he or she did. Explaining human agency takes more than just narrating the facts. Yet, Longerich is wary of doing more than lining up the facts themselves, and he has good reasons to be careful. It is well known that Himmler was fully conscious of the enormity of his actions. There are photographs of him visiting concentration camps and plenty of his speeches have survived in which he confessed pathological anti-semitic hatred. It is the belief that no human being can be capable of this amount of hatred that poses the biggest dilemma to historians. If Himmler was not mentally ill (and there are no indications that he was), then his actions were within the normal range of human capacity to act. This is an uncomfortable conclusion for any biographer or reader indeed. Few thinkers have confronted this challenge of human depravity within the realm of reason head on. Hannah Arendt has tried to point to the bureaucratisation of mass murder (and the psychological distance it affords) as a contributory factor in enabling the holocaust. Yet, few biographers have dared to take up the baton. Writing meaningful biography that leaves human agency intact yet recognises the force of external circumstances is easier done in other historical contexts. Golo Mann has done it for Wallenstein. Mann’s style of writing is sustained by epistemological skepticism about the subject matter whilst maintaining the narrative aspiration to get ever closer to the individual in question. The result is a curious circling of the person, homing in on the object until, suddenly, withdrawing from claiming any potential knowledge in another bout of historiographical pessimism. In other words, Mann’s writing is a true art form, where other historians only recount. Instinctively however we shrink from contemplating something similar about any prominent Nazi. It strikes us as tasteless to try to introspect what we can only assume to be an abyss of human depravity. So, we are left with simple narrating of facts and details, which makes for lifeless and unmotivated reading (and writing). Few things can better illustrate the level of courage it takes to write a ‘Wallenstein’ about Himmler. What now for the voluntary sector? 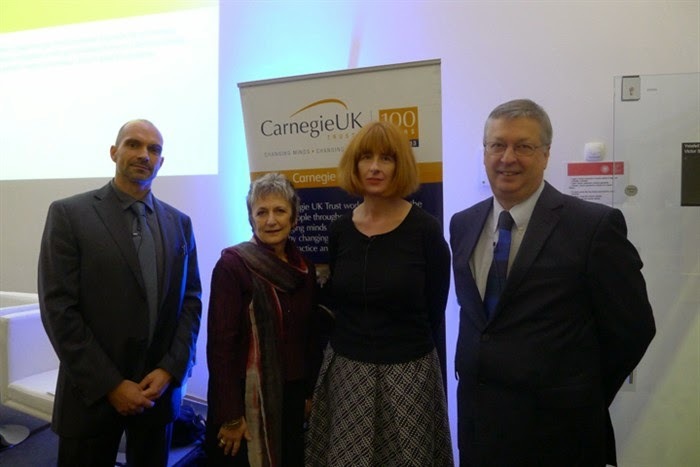 The Carnegie Challenge Debate took place on 24 November 2014 at the Wales Millennium Centre. The event was sponsored by the Carnegie UK Trust and was titled ‘Time for a new social contract?’. The debate was organised by the Welsh Council for Voluntary Action which held their annual conference in Cardiff this year. On the panel were Julia Unwin of Joseph Rowntree Foundation, Dr Angela Donkin of UCL Institute of Health Equity, myself representing Gorwel and Martyn Evans of Carnegie UK Trust, who chaired the debate. The debate proved to be lively with much discussion about whether the state should allow communities a greater say in decision-making and designing the services that make up their daily lives. The panel was joined by people from all across the voluntary sector. GORWEL also published a brief summary of the debate on its website HERE.